Part I (directly below) is on ways to braid longer loop braids. Center braid is 22 feet long, but I call it my “whole-nine-yards” braid, since that’s how long the loops started out. The tried and true traditional way–worldwide–to braid longer loop braids is to cooperate with another braider. This is not hard to do. One of you braids, and the other holds the start of the braid, or stands near where the start is fastened, and does the actual tightening. This can be done by beating the fell with an implement, or by using one’s hands as in the video below—experiment to see what works best for you. A Chinese bronze from the first century BC shows two braiders doing this. The video below is about the Wayuu people of Columbia and their textile crafts. Click the video to start, then drag the timeline “bubble” below the video to 2:25 to see two Wayuu women cooperating in loop braiding an extra-long braid. Video above @ 2min, 25sec shows 2 braiders co-operating to braid an extra-long braid. Unfortunately, there’s rarely another willing braider handy when I want to make a longer braid! So I’ve come up with two workarounds. The center braid in the first photo (above the video) is 22 feet/ 6.7m long–a 7-loop square braid that I made back in 2007, just as a test to see if it was possible. I used the same two workarounds I’ve always used, but this time I used 9 yards, the total length of the floss in my skeins–I made each loop from two skeins of floss tied together. I call that braid my “Whole 9 Yards” braid, although the finished braid actually ended up somewhat shorter, due to take-up. First and easiest, starting braiding from the midpoint/ center of the loop-bundle. This can double the length of your normal maximum-length braid. Secondly — only if necessary — shortening the ends of the loops temporarily into what I call caterpillars, preferably on only one (the longer) half of the start from the center, or for a very long braid, on both halves. This can add a lot of length to your braid, but the start-from-the-center gives you the most extra length for almost no extra effort, so I always start with that. This is the first strategy because it is the quickest and easiest—always start with this one and only add step 2 (‘caterpillars’) if this alone will not be enough. Below I describe 3 different ways to start from the center: Handshake, Exact, and the one I use most: Basic (described below). Basic Center-Start This is the method I use most often, it seems quickest and easiest to me. The center point might not end up at the exact center-point of the braid. In fact, I sometimes purposely place the ‘center-point’ way off-center, if I’m planning to use my “caterpillar” loop-shortening technique on only one end of the braid. Begin braiding at the center-point of an extra-long loop bundle of loops. The loops are only cinched together at the center of the bundle – at each end all the loops are free – not connected to each other. Braid to one end, starting from the center. Then undo the knot in the middle, and start braiding again from the center, but now in the opposite direction. This time, the center starting-point you are braiding from should have NOTHING constricting it – no knot, no loop of string etc or your finished braid will have a section of loose, gappy threads there. Instead, tie the finished, already braided section onto a firm fixed point, and tighten well at the ‘join’ (the center-start point). Click for more details, including how to make a seamless version of this Basic Center-start that involves mounting the ends of the loops onto two combs. Below is a photo of this start used as a loop for the top of a braid, rather than the center of a whole braid. Click on the photo below to enlarge it and see the “handshake” join area at the top of the loop more clearly. Looking only at the loop, and not the rest of the braid below the loop, imagine the loop section spread out as a long braid with that handshake join at its center. ‘Handshake’ loop at the start of a braid, 16-loop Sudarium braid. 8 pink / purple loops were linked around 8 silver / gold loops at the start of the braid. Click twice to see the ‘handshake’ join of the two color-groups at the start of the braid. This can also be done as the center-start to a long braid. Click for a photo-tutorial showing how to set up a handshake center-start. step 2. Shorten the loops (Caterpillars). I use this trick whenever I want more length than I can get from the “center-start” method alone. However I still do a start from the center, since the center-start doubles the braid’s length for almost no extra effort, whereas caterpillars require quite a bit of extra effort in setting up, especially if the desired length would require two or more repetitions of shortening the loops. Short version: I shorten each loop to a manageable length by tying/ crocheting a chain of slip-knots (ie a crochet chain) with the “extra” length. A caterpillar-like chain dangles below each loop as I braid, and pulls easily through the other loops. This adds time to preparing the loops for braiding, but doesn’t add time to the actual braiding procedure. When I have braided all the way down to the caterpillars, I park the loops on a comb, undo the caterpillars, and (if the remaining loop-length is now workable) finish braiding to the original ends of the loops. If the loops are still too long to braid with comfortably, I knot up a second set of caterpillars and repeat this process. Braid was started from the center. Left half of braid completed, right half getting prepped. Important: The blue clip on the braid in the photo was not on the braid when I shortened each loop by tying a slip-knot in it! A clip would have distorted the loop lengths. It’s important to shorten them all to the same length as exactly as possible. 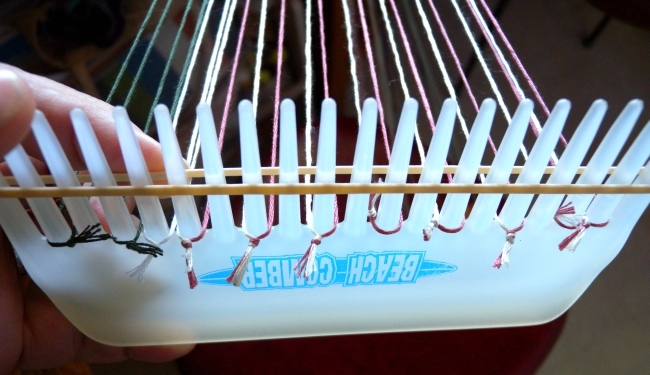 These loops were on the comb when I shortened them – they can slide freely on the comb for comparing and adjusting length – but a comb is not actually necessary, esp for braids of fewer than 10 loops (click link below for more details). After the slip knots were all tied, I manually tightened up the braid at the center-start area where it had loosened. Then I placed the blue clip there to keep this slippery nylon thread from loosening during the next step, when I chain up the the ends of the loops into a chain of slip-knots. I’m halfway done in this photo. Loops on right are already compressed into “caterpillars.” Loops on left are waiting for their caterpillars, with a slip knot placed where I will start knotting (chaining) them up. The shortened loops are actually all equal in working length – they look unequal because of the way they are lying loosely on the chair. I almost always start braids with a loop (buttonhole-type opening), as in the tall braid photo in my right sidebar → ↑. In my introductory tutorials I teach a simple way to set up a loop bundle and start braiding: You make an overhand knot at the top of the loop bundle, which forms a tassel of ends on one side of the knot, and the working loops on the other. If you want a braided loop at the top of the braid, you then start braiding with “divided” braiding moves (no turning the loops) for the first half-inch or so. This creates a loop-type opening near the top of the braid, with an upper knot and tassel of ends just above it. You might end the braid with another overhand knot and trim the ends into a tassel that matches the starting knot and tassel. Or you might finish in various other ways, such as braiding a tassel of thin ‘mini-braids’ at the bottom of the main braid, with a small knot at the bottom of each mini-braid and no big knot like the one at the top. This is a nice way to finish both ends of the braid in the same way: Tie the overhand knot at the top much lower down, leaving a 5 or 6-inch-long “tail” of ends above the knot. Braid. Finish the last several inches as an ending tassel of ‘mini-braids’—(see 3rd video in Bracelet with Chevrons post). Then finish the top of the braid to match: Untie the overhand knot at the top of the braid, tie those loose ends into loops if they are not already joined as loops, and braid them to match the mini-braids you’ve already braided at the other end of your braid. See the photo at left. At each end of this 7-loop braid I finished by braiding a divided 4-loop braid and a divided 3-loop braid — so four mini-braids at each end. After braiding a pair of divided braids, I cut the bottom of the loops to separate the pair into 2 separate mini-braids. Then I used one strand from each mini-braid to tie off the bottom, before trimming all the ends to the same length. Always remember to allow for 2 or 3 inches of extra loop length beyond the length of the braided mini-braids, since you won’t be able to braid all the way to the ends of your loops. Fold all the loops in half in some way that they will all stay connected at the top, and start braiding with divided braiding [=no turning loops] to form a braided loop at the beginning of the braid. Braid a short section of divided braid, then begin the braiding moves of your intended braid, which will join the two divided layers into one braid. Using “divided braiding” (as taught in my Start Here 5-loop videos, and others) is the most efficient way to make the loop at the top of the braid, because both sides of the loop are braided at the same time. Below I show 3 different “no-ends” methods to start a braid with a divided braid section for the loop at the top. #1 is the easiest to learn, #3 is the method I use the most. B. Start braiding at the center of the loop-bundle, braid a short distance, then bend the short braided area in half and join all the loops together into one twice-as-thick braid with a loop at the top. The “start braiding at the center” types of loop-starts take a little longer to braid than the divided-braiding loop-starts, but they are very attractive, and are easier to explain (so maybe easier to learn?). They are all based on the various center-start methods I described above in the section on Longer Loop Braids. Jump to the Center-start loop starts here, or keep scrolling down past the Divided loop starts. This start can only be used for single-color loops. If using any bicolor loops, try the next variation: Divided-braid loop-start #2, or use the completely different Divided-braid loop-start #3. This may be the easiest no-ends start method. The video and pdf tutorial show it with 3 loops, but it can be used with any number of loops. (I made them for my Easy 3-loop Braids tutorial). You can download my pdf 3-loop photo-tutorial, which includes this start. In the video, I use a header cord to hold the loops, while in the photo-tute I use the handle of my C-clamp. (You can also substitute a shower-curtain ring, as shown in the Tips section further down – it combines the benefits of both methods). Either way, it’s basically the same start. Click link for more tips and details, as well as the video. This variation of the above method is good for bicolor loops. When you set up your loops, cut out doubly-long bicolor loops, and only make half as many loops as your braid requires. All the left-hand double-long loops will be bent in half – in a U-shape – so that each loop forms two loops. The right hand loops are then also bent in half, and linked around the whole bunch of the left-hand loops. Each of the two bunches of loops will be in a U-shape, linked onto the other U-shaped bunch of loops. You can easily add a single loop to the rest of these doubled loops (if your braid has an odd number of loops), just make sure the U-shaped bunch of loops of the other hand goes through the single loop as well as around the doubled loops. If that single loop is bicolor, see Tip #2 further down page for a way to form a bicolor loop with no ends or knot at the top of the loop. Click for more details – You can’t just plop the whole bundle of interconnected loops over a header cord or bar. After the two bunches of loops are linked together, it’s important to carefully mount each loop onto the bar or ring one by one, with each upper and each lower shank separated by the bar or header cord. This is the way I usually make a divided-braid loop start. This method is quicker to set up than my other methods, but it is much harder to describe! This loop-start has a flatter join than the previous divided start methods. It is an ideal ‘no-ends’ method for an even number of bicolor loops of the same two colors. But it can also work for an odd number of loops. Loops start out double-length, as in Divided Loop Start #2 above. But here, each double-length loop is twisted at its mid-point to form its own link, resulting in two linked loops. The first few cycles of braiding will feel very awkward because the loops slip a lot and change length on your fingers. But after a few braiding cycles, the loops lock into place and don’t slip anymore. This start can be done with simple 3-loop braids up to very complex ones like this letterbraid. The first step is to make up your loops: doubly long loops as described above, but twisted and mounted as described below. To form two loops from a double-length single loop, make a link in the middle of the double-length loop. Hold both ends of the loop, twist it once so it forms a figure-8, and then twist it once more so it has now received a full twist—a 360° rotation. After the second twist, the loop will still look like a figure-8, but at the center the two long strands are now linked to each other, rather than simply crossing each other. Each strand bends around the other strand. Diagram by Jean Leader, showing a double-length bicolor loop twisted at the center to form two linked, bicolor loops. These are all related to the various methods for starting a braid at the center of the loop bundle — described above in the section on Longer Loop Braids. ‘Handshake’ loop-start, 16-loop Sudarium braid. 8 pink / purple loops were linked around 8 silver / gold loops at the start of the braid. Click twice to see the ‘handshake’ join of the two color-groups at the start of the braid. This works with an even number of loops. If you have an odd number of loops, the single “odd” loop is suspended differently. If your one “odd” loop is a single-color loop: Thread a single strand (not yet forming a loop) around the opposite set of bent-in-half loops, and only then tie it into a loop, (single length) with its single knot at the bottom, where you will insert your finger. An odd bicolor loop will (likely) have two knots, one at the top of the loop and one at the bottom, so you’ll have to live with two ends sticking out of the handshake join at the top of the braid. (Cut those two ends extra long, and you can hide them later by using a needle to bury them within the braid). Or, see my tip #2 below for making a bicolor loop that only has a knot at one end of the loop! (requires using divisible thread or yarn). In either of the two cases above, you might prefer to add the singleton loop into the braid after you have joined the two halves of the braid together – it’s not hard to add an extra loop or loops just below the braided loop at the upper end. See tip #3 further down this page. The Handshake looped start is really just a variation of the more basic Center-start looped start below. In some ways the Handshake version is easier because it automatically and accurately locates the center-point that you start out braiding from. This makes a very nice-looking loop-start. 14-loops doubled spanish braid. Starting loop is a 7-loop Spanish braid, braided at the center portion of a long loop bundle, then bent and all 14 loop ends joined to form the larger braid below the starting loop. Start with half as many loops as your braid needs, but make them twice as long as you would normally make them. So, 3 doubly long loops for a 6 or 7-loop braid. Find the center of this long bundle and braid only the center one or two inches of the bundle–this will be a narrow 3-loop braid at the mid-point of your loops. Then bend that short braided section in half, tie a header cord around its mid-point and fasten that to a fixed point, join all 6 loop ends together (you can add a 7th single loop into the join area at this point if you will be braiding a 7-loop braid – see tip #3 below for adding an extra loop into the braid after the start) and braid with all the loops. Your 3-loop braided section will form a loop at the top of the braid. At this point, you may have to retie the ends of your loops on one side of the braid to make them the same length as the loops on the other half. 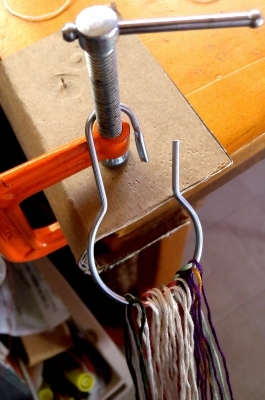 I usually just use the horizontal bar of the C-clamp for this, but it’s a little tricky to spread the loops widely apart for tightening the first few times before the loops have all ‘knit’ together – some loops can easily get pulled completely off the end of the bar. So this type of ring below is a great solution – it’s firm and solid like the bar, but loops can’t fall off it, no matter how widely you spread them. I now use this ring whenever I’m making a braid of way “too-many-loops”, but it would be fine to use for braids of any number of loops. The upper shank of each loop must pass over and in front of the bar or curtain-ring, and the lower shank must pass over and behind the bar. Neither shank should pass under the bar. Both must go straight to the finger with no twist in the loop. For the first half-inch or so of braiding do not turn any loops. If you have set up the loops correctly, a divided braid will form in a big open loop around the curtain ring. If it forms clasped onto the ring or bar, you have made a mistake and should start over – the loops must not clasp onto the bar. That would result in loose, gappy threads at the top, once the braid is removed from the bar. This set-up will only work if at least some of your loops are connected at the top (see my various divided loop-start methods above). If all the loops are single, unconnected loops, the braid would end up falling apart at the top, as loop pulls out of loop pulls out of loop, etc. Open shower-curtain ring. 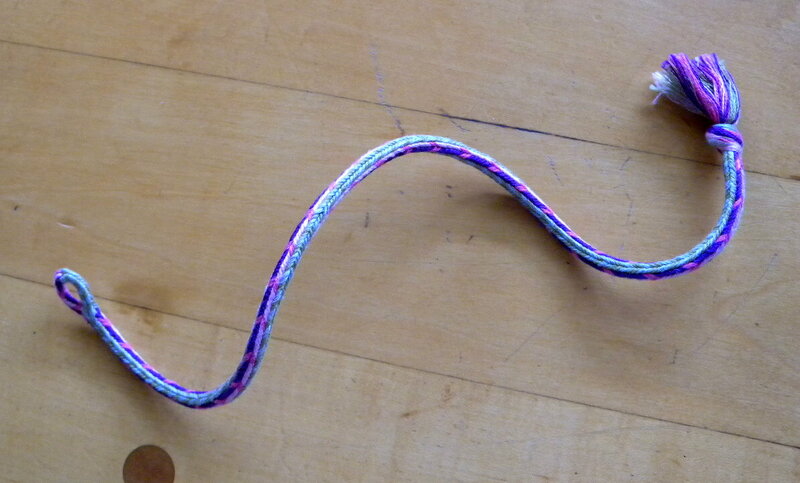 Divided braid loop start #3: Twisted double-length loops have been loaded onto the ring, left-to-right. Loop ends are not hanging free! They are ‘parked’ securely on a comb (see next photo). Before braiding, I close the ring, so the loops can’t slip off during the first tightening moves. I never let go of the end of a loop while setting it up on the shower-curtain ring or C-clamp bar. I keep the ends in their correct order, with no twist to the loop below the bar, no loop passing over or under another loop, and all held securely by fingers or on a comb. (See You can put your loops down.) The advantage to a comb is that it can dangle freely while still keeping the loops in their correct order (if a rubber band is in place). I always set loops down onto the teeth in the same way, palms facing UP, so my fingers match the orientation of the teeth of the comb, and I pick the loops back up by inserting a finger into the loop from below to keep the same orientation. When I’m ready to braid, I snap the ring shut, and then load the loops from the comb onto my fingers, taking care that each upper shank passes over the top of its finger, and goes cleanly to the upper side of the ring (or bar of the C-clamp) without twisting, and with no lower shank crossing above any upper shank, and no loop passing over any other loop(s). Any of those possibilities would tie the loops together just under the metal bar after you start braiding, and result in a messy start to the braid. Tip 2 – To make a no-ends-at-the-top bicolor loop: If you are using a divisible yarn like embroidery floss, you actually can make a single bicolor loop with no knot or loose ends at the top (only at the bottom): Cut each length twice as long as the loop will be. Then divide each length in half – so 3 strands of floss instead of the full 6 strands – and make a bicolor “departed” loop. See the first two illustrations on this linked section of a page on fingerloop.org. (Ignore the third/ lowest illustration.) This ends up doubling the thickness of the strands, which will double them back to normal size, while leaving no loose ends at the top of the resulting bicolor loop. You can do this with any type of start. There are various ways to do this, especially when adding several loops below the braided loop start. Below I’ll describe a very handy workaround for adding a single ‘odd’ loop into any braid after you have braided a divided loop at the top, right at the point when you are joining the loop together to be one cohesive braid. If the extra loop has no ends at the top: Make that loop a bit shorter than the others, since it will be added below the start of the braid. 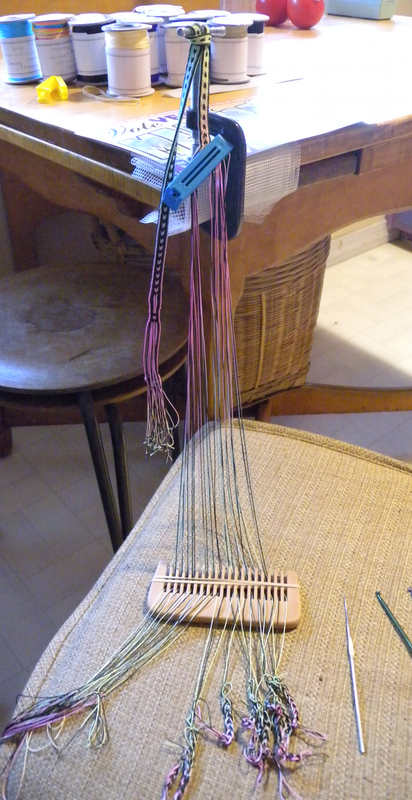 When it’s time to add it, suspend it from its own separate header thread – put a thread through the top of the loop, make it into a short loop and suspend that header thread from the same attachment point holding the main braid, just long enough that the top of the new loop is level with the bottom of the braided loop-top. I usually get this ready in the beginning when I am getting all the loops ready for braiding, and then hang the extra loop into place just when I’m about to include it into the braid. It doesn’t matter where the new loop hangs – it’s fine to hang it on the outer edge of all the other loops, even if you will be adding it into the center of the braid. It’s the finger you place the end of the loop onto that determines where it will enter the braid, not the position where you hang it. The header thread should suspend the new loop low enough that the top of the new loop is about level with the point where you want it to join the braid. Place the bottom of the new loop onto a finger where you know that the first braiding move will pull a different loop through the new loop, and not on a finger where the new loop itself would be the first loop pulled. After a few more loops have been braided through the new loop, cut and pull out the temporary header thread. Then you can gently tighten the new loop down into the braid – just enough to prevent any loose bits from sticking up where it joined the braid. If the extra loop has a knot and two ends at the top: A separate header cord is unnecessary if the extra loop has a knot and 2 ends protruding from the top (that you will hide by sewing into the braid after it’s done). In that case, cut the loop to be extra long, but tie it to be the same length as all the other loops are hanging from the bar once you are ready to braid the main part of the braid. Your extra loop should have extra-long ‘tails’ beyond its knot at the top that you can later sew and bury within the braid. It’ll be easiest if its knot at the top is a slip-knot, since you will be untying it later. Suspend the extra loop from whatever the top of the braid is attached to. Its upper knot will be far above the point where it enters the braid, and its bottom knot should be level with the bottom of the other loops of the braid. Read and follow the info in the previous paragraph regarding which finger to place the new loop onto, etc. After the braid is done, untie that upper knot, and thread those two long ends onto a needle to sew/ bury them down inside the braid to hide them. Bring the needle out, and clip off the extra thread close to the braid, leaving the ‘tails’ inside the braid where they won’t show. I totally understand if all this text is too much to wade through! But nit-picky tips like these are much harder to video than rote braiding moves, and there are just too many of them here. I would need a camera-person, an editor, a studio with decent lighting (as opposed to the top of my kitchen table between 2 and 4 in the afternoon! ), and a lot of carefully-planned scripts and storyboards. Ad-libbing doesn’t cut it for complicated little details. I’m not a videographer – it took me months after starting this blog to get myself to start doing the barebones braiding videos I’ve posted here. (I spend a lot of time on each one, actually, despite how barebones they may seem!) The few detailed “Tips” videos I’ve attempted to video on my own required retake after frustrating retake, and I ended up giving up on most of them. None of these tips are even necessary, in fact. You can make great braids without any of them, and likely come up with methods that work better for you than the ones that I’ve evolved. I’m just putting this out there for others to glean whatever might be helpful. Please don’t hesitate to ask me about anything that isn’t clear, I love braid talk! How do you like to make longer braids or other types of starts and finishes? *Take-up refers to the length lost while braiding. Loops don’t travel in a straight path down the braid, they travel diagonally back and forth across the width of the braid, so the finished braid will be noticeably shorter than the loops you started with. 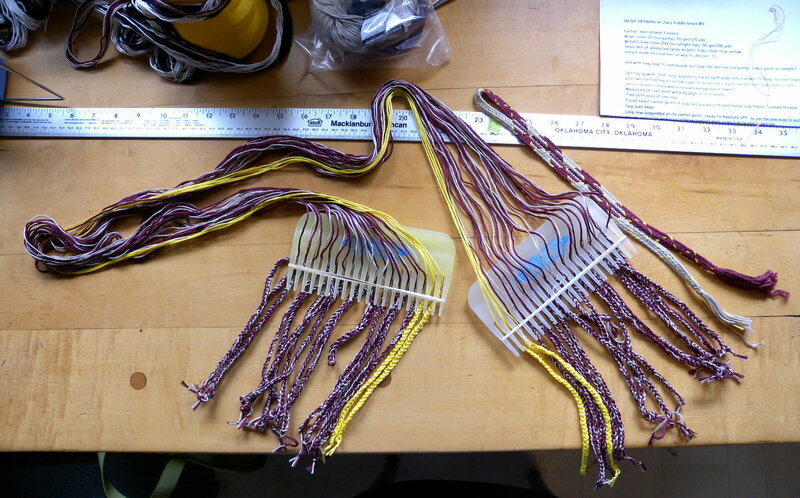 Take-up varies, you lose more length with wider braids (more loops, and/or thicker thread). Probably tightness or looseness of tension would also affect take-up. Don’t forget to add in a few extra inches for the knot and tassel at the top, and even more for the end, as you won’t be able to braid all the way to the ends of the loops. My 7-loop “Whole Nine-Yards” square braid made with embroidery floss started out as a 9-yard-long loop-bundle, and finished as a 7 yard, 1 foot braid. A 5.5 foot long, 18-loop flat double braid made with sport-weight cotton yarn (about twice the thickness of embroidery floss) started out as a loop bundle that was 10 feet long plus a few inches extra, though I did cut off some extra inches of unused loop-length after finishing the braid (maybe 5 or 6 inches?). Wet-finishing or washing a braid will often result in a slight additional loss of length, depending on the material used, so that should also be taken into account. The same loop-rearranging trick works for an A-fell center-start braid: At the start of the second half of the braid, loops will be coming out of the center-start in V-fell configuration. So on each hand’s loops, one-by-one pull the inner loops through the outer loops, til they are all in proper A-fell order. 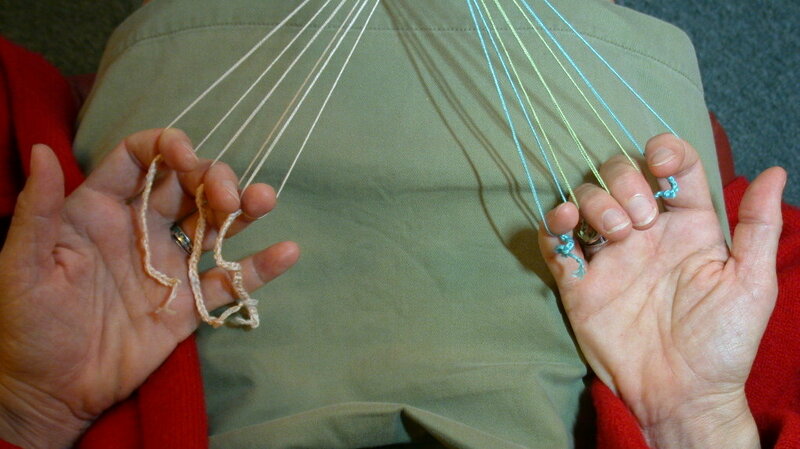 In an A-fell braid, the loops on any one hand all cross each other as they head down from the braid to your fingers. Each loop passes through and/or around other loops of that same hand. In contrast, the loops of a V-fell braid do not pass through or around any loops (of the same hand) on their way from the braid to the fingers. Pause your braiding sometimes, and take a look at the loops coming out of the fell – the bottom of the braid – to get used to how they should look. This can be a big help later when trying to replace a dropped loop correctly, as well as for doing this (optional) center-start rearranging… In an A-fell braid, the loop that heads out from the middle of the braid will end up on an index finger – an outer finger – after passing through all the loops of one hand. The loop that starts from an outer edge of the braid will end up on your ring or little finger as one of the two innermost loops, passing around all the the other loops of one hand. The other loops will also pass through and/ or under loops in their path from the braid to your fingers, all in a very clear sequence. The rearranging tips above are for square (or flat) braids. Other braids don’t necessarily have an A or V-fell. Double braids for example: Their loops can also be rearranged back into the correct starting arrangement after the turnaround point of a center-start braid, but it will look different than the simple A or V -fell loop arrangements for square braids. After you get familiar with how loops should look at the fell, you’ll be able to figure out how to undo or redo the loops back to that same arrangement after the center-start turnaround point. Hi, I have been living on your site for the last few weeks. Just stumbled onto finger loop braiding while researching patterns for kumihimo and am in love! But I’m wondering if there’s a way to use the little plastic buckle clips for bracelet closures? I can start the bracelet but can’t figure out how to end it. Do you have any tips? 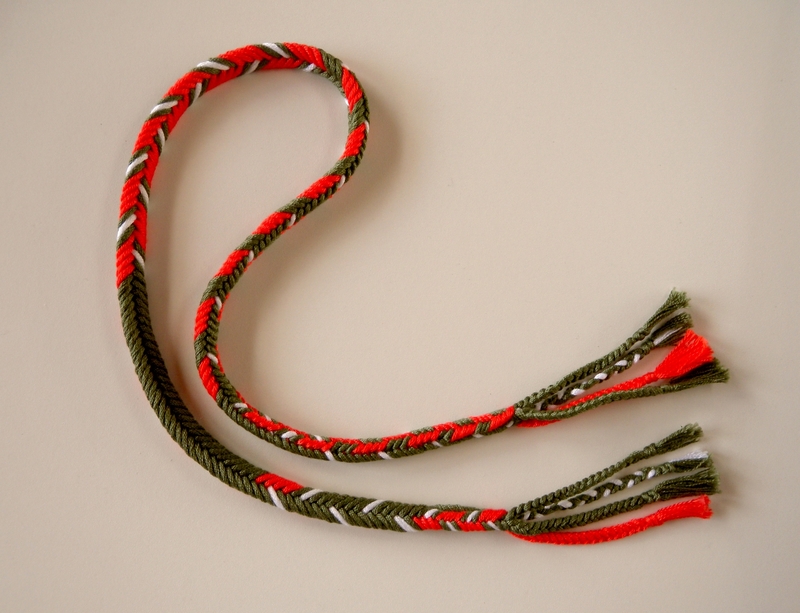 Or do you know if it’s possible to make a flat braid around a central line like in paracord braiding? Thanks for any help!!! “Paracord braiding” – you must be a mind reader! Yes, it really is possible to use loop braiding to braid a tubular “skin” around a pre-made core – either another braid or a string or any flexible material. I used to think this wasn’t possible with loop braiding, but turns out I was wrong. It’s not hard to do but it’s a little hard to explain. I learned it maybe a couple of years ago, but so far I still haven’t taught it or posted about it here. 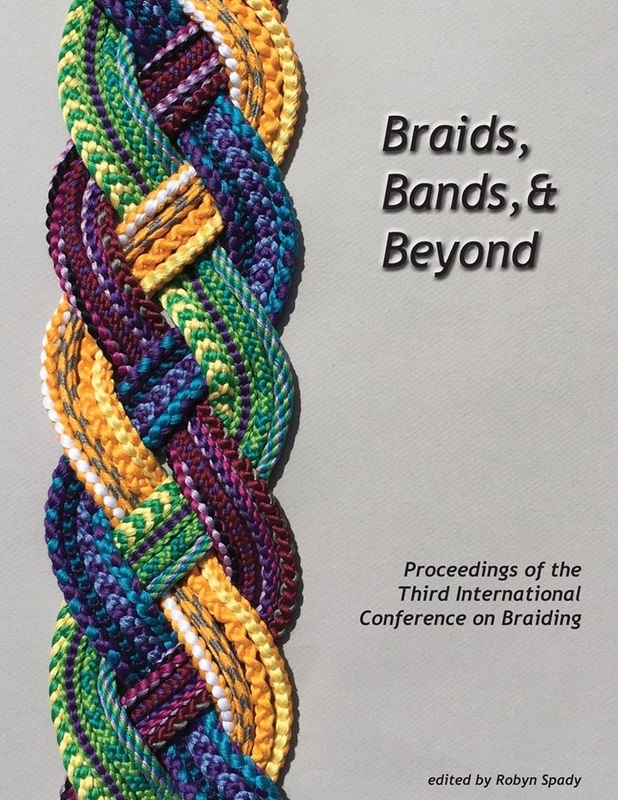 The reason you’re a mind-reader is that after months of not thinking much about braids, just yesterday I was was thinking about this exact thing, and idly writing up a possible workshop description for it, thinking titles like “Make a braid around that” or “Braid your own Paracord”! I am so jazzed to hear you are enjoying this site! Especially since I haven’t been posting at all lately. I’m still around, but have been busy with work and other things. I do have two or three half-written-up posts on “standby”, so those will be up before too long. When I need to shorten long lengths, I do start chaining at the ends. I tie a slipknot at a good starting length in all the loops together and secure it with a paperclip or a stitchmarker or something. Then I can safely chain from the end towards the slipknot and all the loops will end up the same length. I secure each crochet chain by pulling a lark’s head knot through the last link with a short piece of scrap yarn. Hi Katia – Thanks for this great idea! Sorry to take so long to reply 😦 I’ve been on vacation from this blog lately and I must have missed the email notification I usually get when someone leaves a comment. I would tie a slipknot in all the loops bunched together, then chain up to the slipknot and adjust as needed. – hang the loops on your header cord and compare the lengths. Take a few minutes to add or remove a few chains on some of the caterpillars until the loops match. – once the lengths match, either replace each paperclip with a contrasting piece or scrap yarn, or wrap a small elastic around your caterpillar bundle and the clip so it doesn’t get snagged while you’re braiding. Tiny safety pins work best for me, they don’t snag as easily so you can leave them in and don’t need to bother with scrap yarn. And you can even use the safety pin to shorten really long caterpillars: before closing the pin, poke the end of the caterpillar on it as well. I’m so glad you like the idea, your website is amazing, thank you so much! I know what you mean about “I’ve since changed my tactic” – I’m always doing that, and then I have to decide whether to go back in a tutorial and say Oops, I do it differently now, or just leave it as it was! Ok, it was always that last bit about “comparing the lengths, and adding or removing a few chains until the loops match” that I could never get to come out right years ago when I tried doing it this way. One crochet stitch seems to take up a LOT of loop length. Now that I know it’s worked for you, I’ll give it a shot the next time I need a long braid. Thanks for the tip, and for writing! I wonder if it’s because I tend to crochet quite tightly because I make a lot of plushies and I don’t like the stuffing showing at all. So when I pull on the braiding loops, not much of the caterpillar thread slips back out. If you crochet too loosely, the last few stitches slowly tighten as you start loop braiding and a lot of thread can slip out. Maybe if you make sure the last few chain stitches of your caterpillar are pulled very snug before you start braiding? Thank you for the video on Colombian techniques detailing how two people can work together in longer fingerloop projects. At ~3min 20-30 what kind of ply-split work is this woman doing? Do you know anything more about it? It resembles at first glance a kind of Peruvian twining that Roderick Owen teaches but here she is using the tool used in ply-split work. I had no idea ply-split technique that could create such colorful patterned bands. Hi Lausanne! Isn’t that a fun video?! I’ve only done a teeny bit of ply-split braiding myself, but have friends who do it and I’ve seen lots of colorful examples. My guess is that the woman in the video is doing single-course oblique twining (a.k.a. SCOT) using ply-split braiding. Long-ago Andean and Japanese braiders also made this same type of braided twining using hand-held loop braiding (though in the Andes loops were often turned in “countered” directions rather than turning all the loops of the single course in the same direction). There are other types of braided twining as well… In the Andes they also made non-twined braided structures with loops, and did a lot of mixing it up with different structures within the same braid. Whereas I think ply-split braiding is all and only twining. But in any case, yes, it’s definitely possible to create the same braided structure using very different braiding methods and tools! The resulting “look” of identical structures can seem different because of tensioning differences. Ply-split can be done a lot tighter than the typical loop-braiding, because a lot of tension can be put into the initial plying of the “rope” that the braider then splits. could you make a video demonstrating the way you start most of your braids? Sorry, but no [see my new disclaimer above]. My usual start is too fussy, I can’t do it with a camera in between me and the threads. But check out my 3-loop tutorial video above—it demos a divided-braid loop-start that’s very similar to my usual one, and can be used for any number of loops. Another loop start that I call the “Handshake” loop start is demo’d in a video in my Bracelet with chevrons tutorial — the second video in that tutorial. Thank You for this marvellous website! I’m just making my first steps in learning the fingerloop braiding. You’re welcome, and thanks so much for the note. I hope you have fun braiding! Have you tried winding a butterfly bobbin with the extra length instead of crocheting it up into a chain? When I make them, I wind them around my thumb and forefinger so they stay fairly small. I tried that early on and it didn’t work for me–when you try to braid, the butterfly bundles get stuck in the loops or even pull the loops off the fingers. Plus, just hanging there they would sometimes hook around / tangle up around each other. A chain pulls through the loops completely smoothly, and they never tangle up with each other. You can certainly try it! Maybe if you then tightly wrap each butterfly so it’s really like a tight ‘cocoon’ it would come through the loops easily. But the caterpillars work so well that I have no incentive for trying anything else myself.